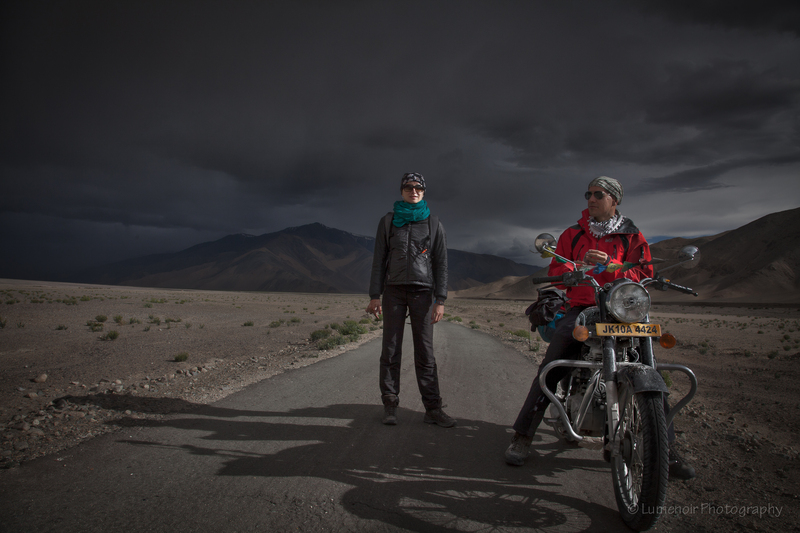 Riding In Ladakh: Turning Roads Into Rivers. - Travel Soul Therapy Blog. Our intentions to have a homestay in Tsaka were quickly curtailed – we couldn’t find a place that would offer such an opportunity. We understood that it was a remote place with probably limited supplies of food available. 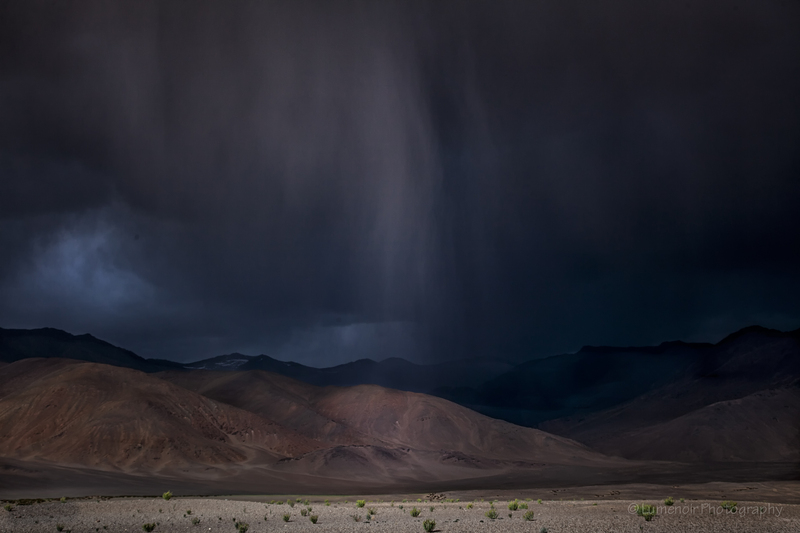 Meanwhile a dark blue curtain of heavy rain that followed already reached us with occasional gusts of hail. We still needed about three hours to get to Chushul. 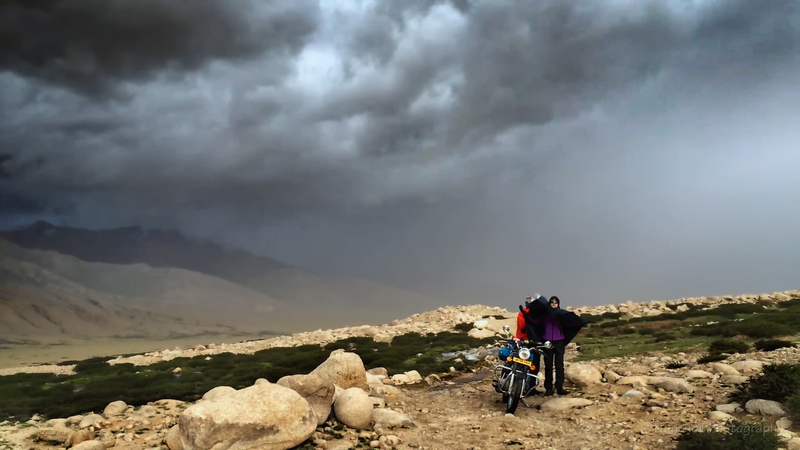 It is a military outpost attached to a much bigger village than Tsaka and it has a better road connection to the main well-travelled entry into Pangong Tso. Now it was time to keep up a fast ride to beat the storm and a nightfall. 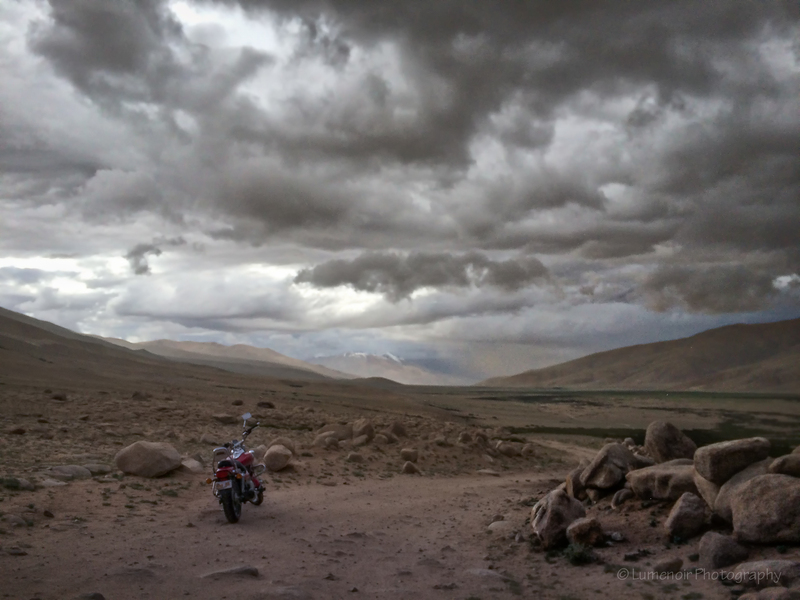 Over Tsaka La pass (5680m) there was another river that required a honed riding skill and a confidence in the Indian motorcycles. 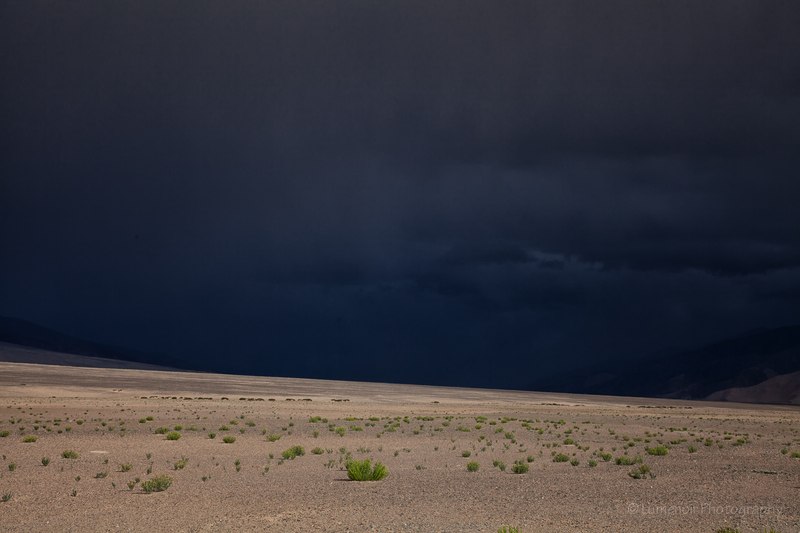 The darkness of approaching rainfall behind looked ominous and it only added urgency to press forward. The adventure mindset was fully turned on, characterized by intensity of a laser focused awareness of the present moment. The daylight was noticeably loosing its luminescence when a lone Tata truck showed up from behind the bend. The driver flashed his lights few times. In response I waved a polite greeting thinking “good to see you too”. Only later I realized what it all meant. It wasn’t a conscious everyday me but another part that can’t think “what if”, “but” or “I am scared”. With a speed of a galloping desert animal I came to a complete stop. The road ahead disappeared beneath the wide surface of a river full of spindrifts. Regardless of how skookum I considered myself to be, my heart just dropped its rapid rate and I felt a numbing crawl of denial arresting my breath. I even remember uttering syllogistically: “No! It can’t be!”. The river covering the road was wide. It looked swollen and treacherous in its crazy rush. There was nothing to suggest an alternative way of negotiating this furious obstacle. To turn back? It was an hour and a half ride into a storm that was about to crash. Wait here? It was going only to get more intense. Soon another party caught up with me and Martin with Anna had the same impression. Gusts of wind with rain started reaching us. There was no time to wish for anything to be different, it was time to act and completely abandon a comfort zone, whatever that was. I turned back and was stunned to see a bike laying flat pinning Martin down into the river. Martin jumped off the Royal Einfield and waded in to the river to measure depth of the rapids. I sat on my Avenger revving it up, staring into the river and wrestling with a demon of negative fantasy of being washed of the motorcycle in the middle of this mad river. I saw where its depth was going upwards his crotch. Repulsed to the point of ferocity, I remember myself kicking the gear in and releasing the clutch. It wasn’t a conscious everyday me but another part that can’t think “what if”, “but” or “I am scared”. It took over and in the next minute my body was moving on top of a swimming metal machine rattled by the burly current reaching up to the tank, loosing and finding traction at the bottom but magically moving across. In a moment that went like a slow motion movie, my Avenger jumped over a submerged bank, gained momentum and ripped itself out of the water. By now the rain was beating down hard. I swiftly regained my sense of ground and marveled how did I make it across the shooting stream with the motorbike that was still cranking. My body sensors came back on and I felt icy cold coming from boots full of water and gusts of whooshing around me. In a hurry I put the bike on the stand without turning it off and turned back to see how the other party was doing. I saw Anna bravely storming the river. She yelled “Please go help him!”. I was already back fording the stream. when I saw Martin’s Einfield stuck in the water across the river. A thought of it being a reality TV, albeit unscripted flashed across my mind. For a split second there was an evaluation of how dreary was this condition, but it was abandoned on the spot. I remember jumping into the cold misery and dashing across the river and helping Martin push the motorbike onto a tiny elevated rock accumulation. It was clear from a wide-eyed look on Martin’s face and a quiet demeanor that he moved beyond panic into a zone of a “braveheart”. After a brief exchange about best possible trajectory drawn across the water, I was stomping back in the river to cross it again when I heard Anna’s scream “Martin!”. I turned back and was stunned to see a bike laying flat pinning Martin down into the river. From that moment on adrenaline took over causing me to wildly sprint across the river again, anticipating the worst. What if bones are broken? Before Anna used to say that she can’t stand the cold. Martin remained comically calm in a context of mad situation: “No stress, just take the bike” he said with utter serenity. In a moment Anna braved to cross the river back and was helping me lift up the Einfield off Martin in the river. I felt immense relief seeing Martin stand up and shake off the tension out the right leg that was pressed down under the motorbike. In the midst of this intensity we didn’t notice the gloom that finally caught up with us. There was no time for anything else except going forward. Martin pushed electronic ignition of this rugged Indian machine and though one expected it to work, it sneezed and got started. This time he didn’t sit on the bike, but put his feet down into the river bouncing from one step to another Martin wrestled across the raging current. Settling back into a saddle I felt that a completely different life was lived within that event. As if a stranger’s life somehow was woven in a thread of moments in my consciousness. 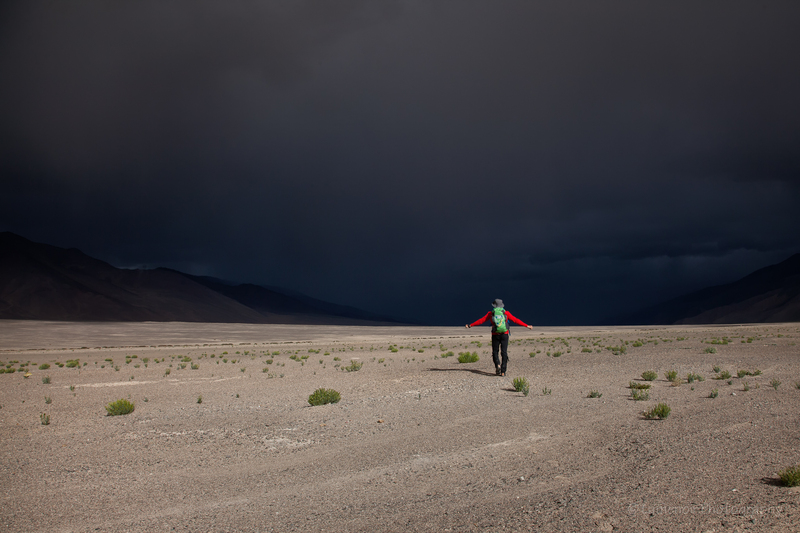 This is the essence of the Adventure Quest – to feel unexpectedly intensely alive. When everyday familiar you is cracked and stretched beyond what once was comfortable. 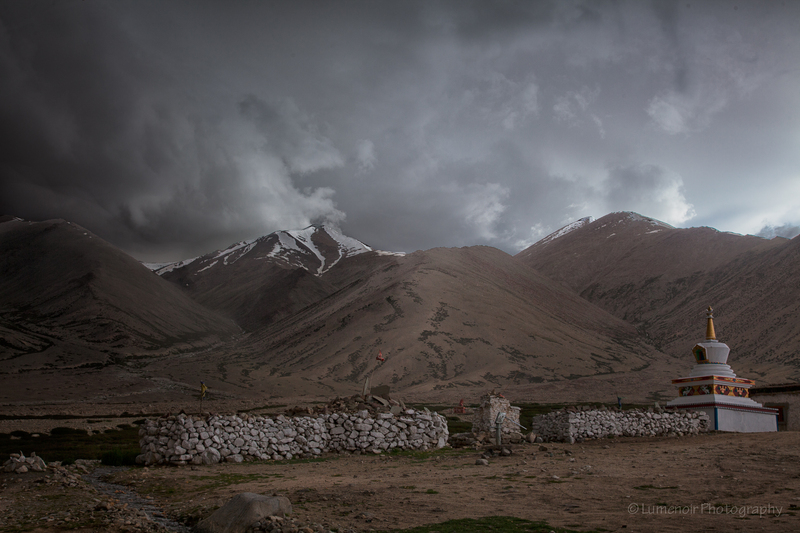 The light was getting scarce as we were rushing to reach Chishul. A nebulous outline of tracks that used to be a road was darting in and out of view. Frequently it was lost in the weather and I used a point in a horizon as a navigator. 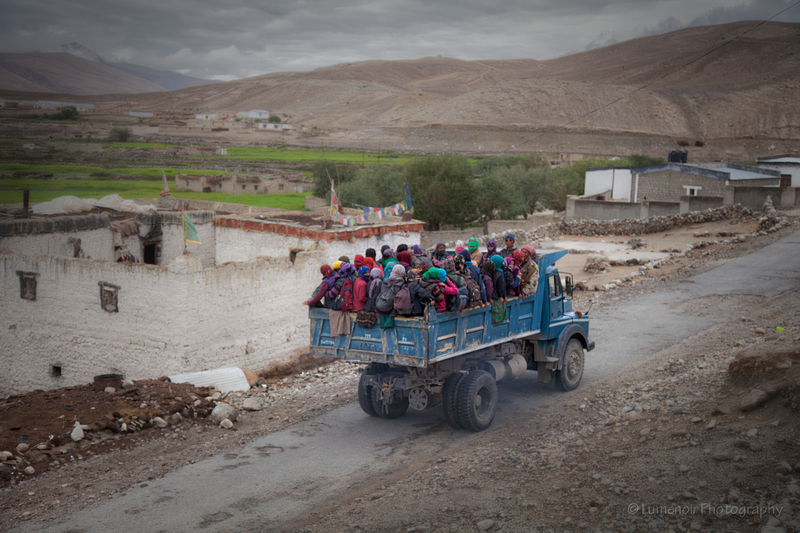 When we reached a frontier town of Chishul, it was nearly dark. The rain got thinner and wind died down. 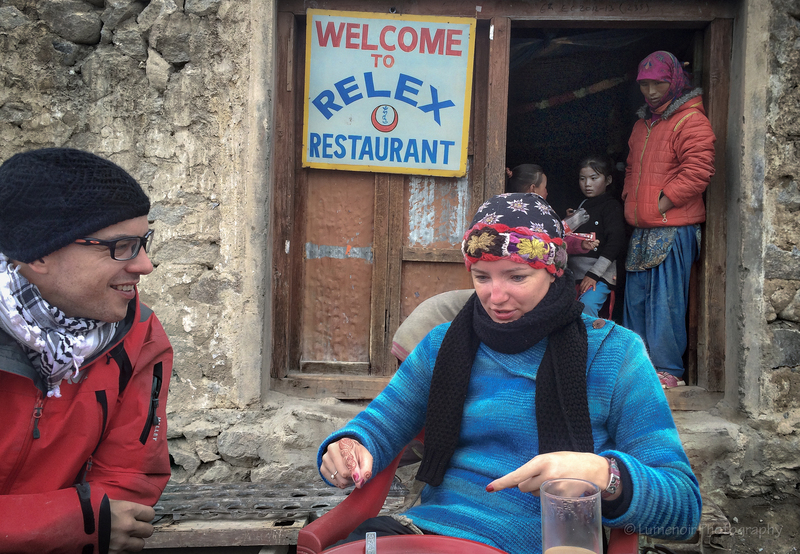 We were cold and when stopped by the Gompa on a hill, we knew that we need to secure a place to warm up very quickly. I saw two Tibetan men uphill. 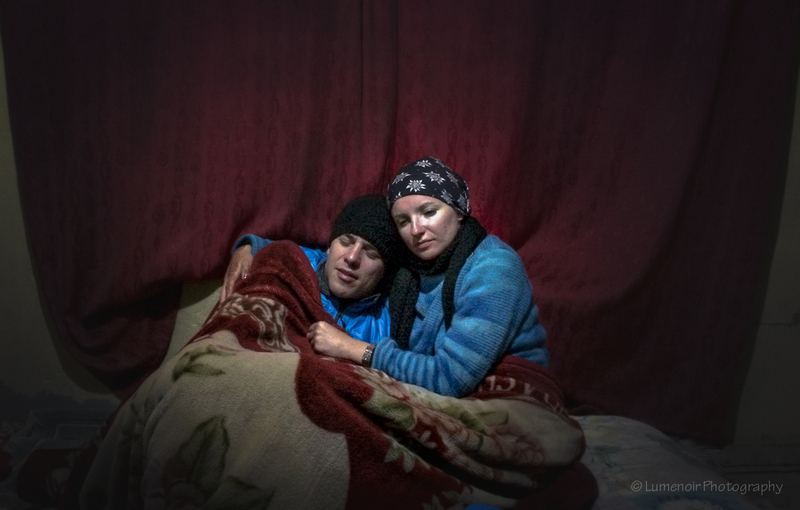 I ran up to them and after exchanging “Juleys” asking them one word – “homestay?”. They were surprised to see Western faces here and immediately recognized what we’ve been through. With apparent celerity they started running down signaling to follow them. The first bigger house was locked up, but men didn’t give up and took us to another one. They briefly talked to the owner who agreed to let us use newly-built house above the road with a warning “No Padhum”. It was meant “No Bathroom”. We were taken into a large room. They immediately told Anna to be wrapped in a thick blanket and rest. It seemed that the entire family turned up to cater to our comfort. Father brought large thermos with milk tea, his two curious young daughters followed with glasses. Tea followed by hot broth and an hour later with a delicious homemade thukpa, a traditional Tibetan soup made with thick noodles and vegetables. Finally we reached our heaven – to be out of wretchedly wet clothes and shoes drenched in water, to be in a warm blanket and to have a tasty hot meal. This paradise with a composting “Phadum” outside would greatly suffice.